A consultation exercise open to every resident of Krakow has been launched by a Polish MP hoping to put the future development of the city into the hands of the public. 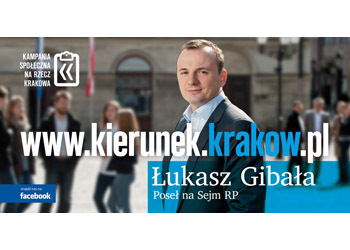 Civic Platform’s Łukasz Gibała is sending questionnaires to every home, and inviting members of the public to put forward their opinion about Krakow’s major problems and the direction the city should take. The former Krakow city councillor said that only residents could effectively advise politicians on the way forward for Małopolska’s capital – and, in the process, take an active role in making the city richer, cleaner and more beautiful. The questionnaire asks residents to rank issues such as local government effectiveness, the state of roads, cultural life, public transport, city cleanliness, health care, education, and public safety. It also includes a section where residents can give their opinion of the three biggest problems facing the city, and ways in which Krakow could be improved. As well as being a member of the Sejm representing Civic Platform (Platforma Obywatelska), Mr Gibała is a businessman and holds a doctorate in philosophy from the Jagiellonian University. He also studied at the US University of Notre Dame, before returning to Poland. As a politician he set up a PO group in Krakow – a city currently under the independent control of Mayor Jacek Majchrowski. His campaign comes ahead of Poland’s Prime Ministerial elections, to be held this coming autumn.